We love the pavlova meringue cake in our house, but my least favorite part is cutting the cake and serving it because it kinda just breaks apart and doesn't make a pretty presentation. Which is why I turned the large cake recipe into individual servings. It is great portion control and you don't need to cut and serve it. Plus, I think they look adorable. 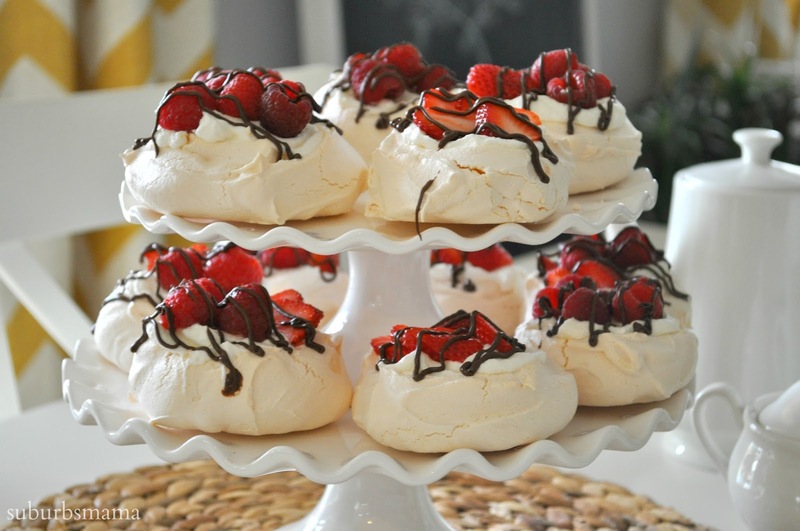 The recipe makes 12 individual pavlovas. Preheat oven to 300 degrees F. Line 2 sheet pans with parchment paper or a silicone baking mat. 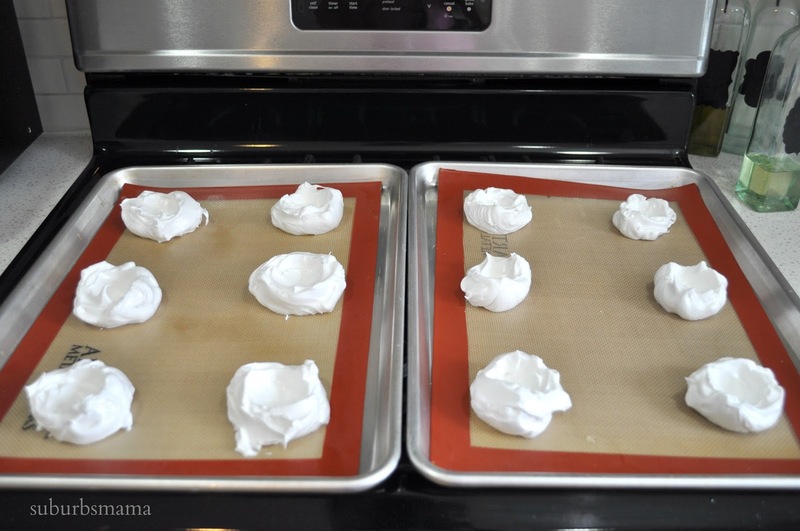 Divide the meringue mixture into 6 circles on each sheet. Using a spoon, make a small dent inside each meringue for the filling. Bake at 300 degrees F for 30 minutes. 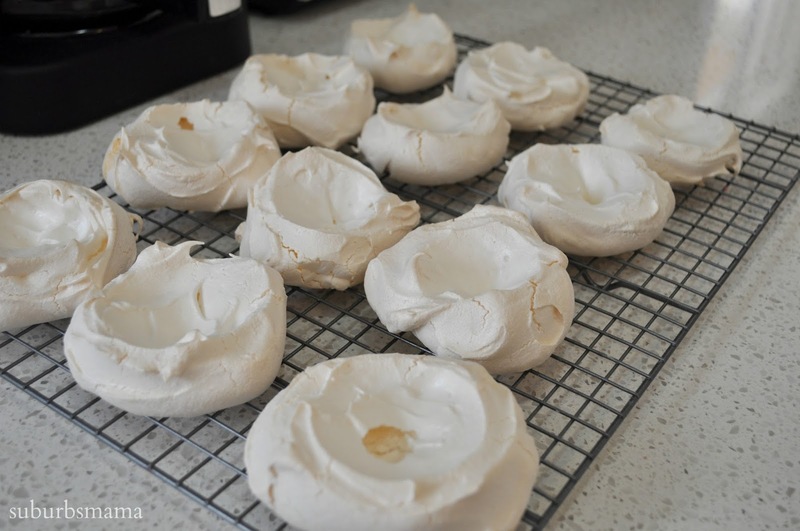 Turn off oven, but leave the meringues in oven for an additional 30 minutes. When cool, the meringue should be hard on the outside, and slightly moist on the inside. In a large bowl, combine the cream and half a cup of sugar, and whip until thickened. 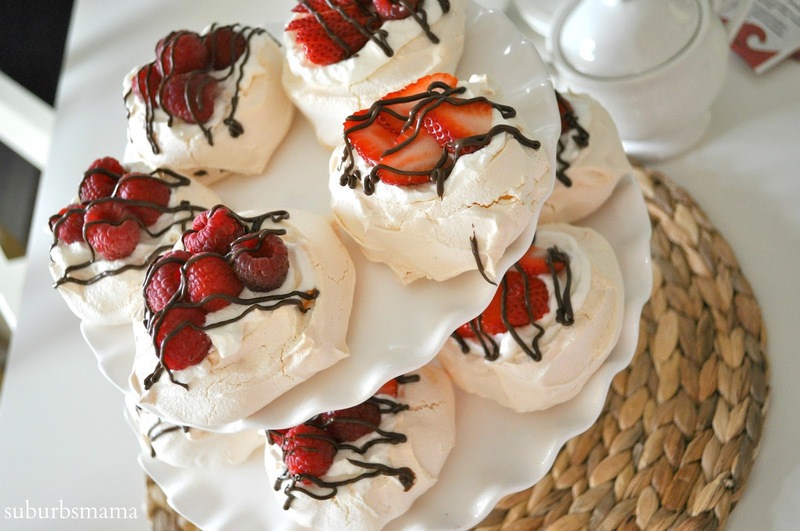 I also like to drizzle some melted chocolate over the meringues. I melt 1/2 cup of semi sweet chocolate chips in a microwave and put them into a disposable pastry bag (zip lock bag would work too), cut the corner and drizzle over the berries. It hardens in a few minutes. Oh these sound/look so good! I love individual sized desserts, and I love fresh stuff like this as we go into spring/summer... will be bookmarking for next time I host book club! Thanks for sharing. I was asked to bring something to a high tea and will be making these! I made these a few weeks ago and I can honestly say this is my new favorite dessert! Nothing compares. I will be making these for Passover in a few weeks, and I'll make them even smaller this time...thank you so much for sharing your recipes.